2Lt Ervin J. Pfahler (CP)(KIA) - Stood down on mission 145. Mission 150 flown with 2Lt Frank Maxey (P). Substitute CoPilot, 2Lt R.A. Knight, used with the 2Lt Determan Crew on two missions (145, 150). 1Lt Lamar E. Ledbetter (B)(KIS) - Stood down on mission 160 & 163. Substitute Bombardiers used on three missions- 2Lt Lowell L. Rickey (160), 2Lt James A. McCamy (161, 163). 1Lt Ledbetter flew 19 credited missions with other Pilots: Regular crews (161, 164, 171, 176, 177); Lead Crews (175, 182, 192(Abort), 193, 195, 200, 207, 209, 211, 214, 227, 228, 231, 235, 236). Completed combat tour (28 credited missions) on 5 Sept 1944 (Mission 236). LtCol Ledbetter was Killed in Service on 20 February 1963 on a B-47 training flight with the 343rd BS, 98th Bomb Wing, stationed at Lincoln AFB, NE. S/Sgt Milton C. Hendrickson (E)(KIA) - Stood down on mission 150. Substitute Engineer - Sgt Leonard R. Vodicka. 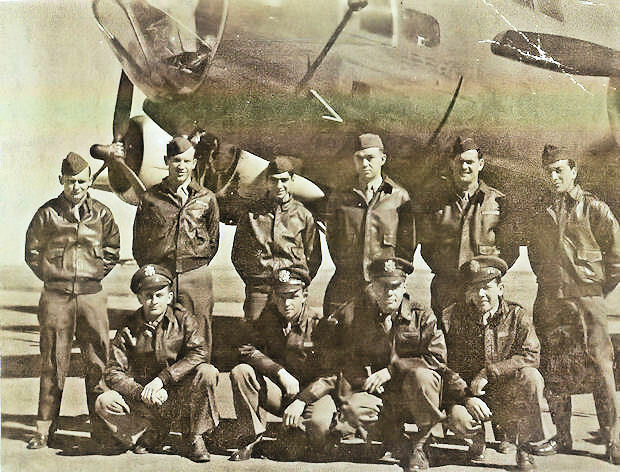 Sgt Acel E. Livingston (WG)(KIA) - Stood down on missions 151, 152, 154. Substitute Waist Gunner - S/Sgt Edward R. Barteau. 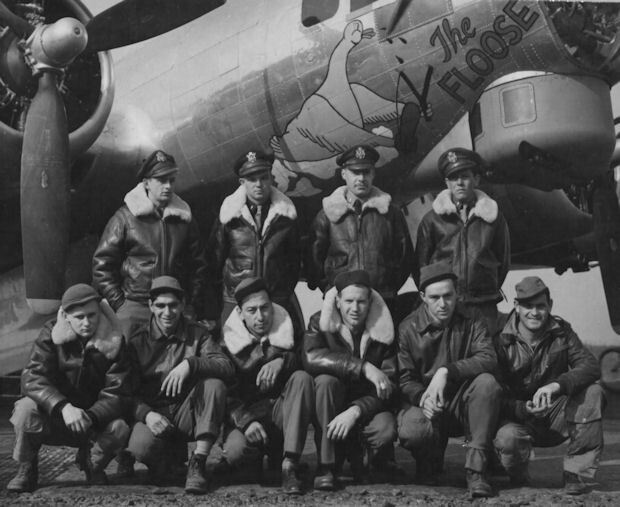 Sgt Wayne E. Cope (TG)(POW) - Stood down on mission 145. 2Lt Jackson Palmer, Jr. (N)(KIA), S/Sgt Robert H. Asman (R)(POW) and Sgt Manuel Vasquez (BTG)(KIA) - Flew on all twelve 2Lt Determan missions.